I enjoyed being able to watch the 12th Doctor announcement at the same time as our friend's across the pond. It was made possible because of the surging fan base that's grown up in this country. With America having come to love Doctor Who in recent years, it has, more than once, occurred to me that it's only a matter of time before the US begins working on its own inept version. Mind you, we have played a hand in the Doctor before. The whole '96 Paul McGann TV movie was intended to be a pilot for an American version. Co-produced by the BBC and FOX, it was not very well received here in the states. Course when you're trying to push Eric Roberts as The Master... That's just a tough sale. But it's still not the same thing. 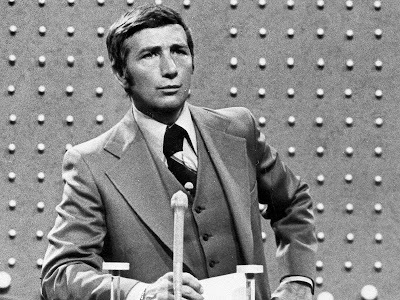 We Americans have the grand tradition of taking TV shows from other countries, and remaking them here in a lesser, generic fashion. And so it was one afternoon, as I was pondering this and watching afternoon crap TV that I realized that I don't have to worry; America already has its own version of Doctor Who. Yes, it's true, for all intents and purposes, our game show, Family Feud, is the US answer to the popular British Timelord. How so, you ask? The show, which started in 1976, has featured several different sets over the years, each a distinct picture of the inside of the TARDIS. You can't tell because we only see the a small section, but it's actually bigger on the outside. Each Doctor or "Host" has had his own changes come to the set. As if the living entity of the TARDIS changed to match its Doctor's personality. Please note the console in the middle which sometimes requires two people facing each other to operate. It's true, our Doctors are more finicky about their companions. The Doctor likes a lot of company and usually he can be found traveling with 10 companions at a time. In many cases, they only get to come for one adventure. But there are several instances where companions have stayed for five trips, plus come back for special mash up episodes, where they are reunited with the Doctor. I've fallen in and out of love with so many of them, it's hard to recall them on an individual basis. To date, over the decades, there have been 6 Doctors. 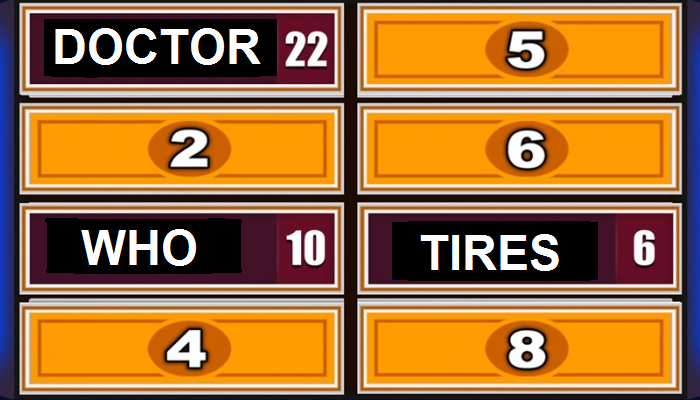 Some might consider Al Roker a 7th, for his short series of Celebrity Family Feud, but while amusing, I don't consider it canon. It's generally viewed that the 5th Doctor, John O'Hurley (Seinfeld) was the least popular, though I rate him personally as 3rd best. Certainly better than Louie Anderson, who, like Christopher Eccleston, was the first Doctor when the show returned after briefly being cancelled. Though of course with none of the warmth. 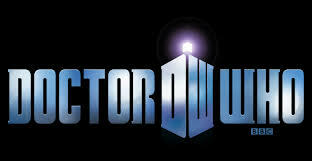 Like the British version of the show, our doctors regenerate, often changing age and becoming younger. To our credit, a little diversity has been shown as well with our current Doctor being black. Personalities are also varied from Doctor to Doctor. Our current Doctor seems to enjoy the more blue comedy. I guess I'm old fashioned, but I like 5's subtle shock at things the companions say. Doctor Who is a question, and one that's been at the heart of the show since the beginning. 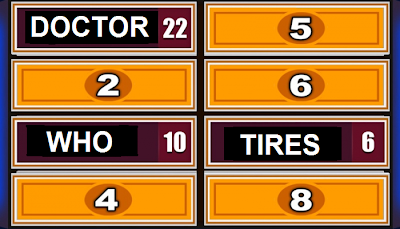 With Family Feud, it's all about getting to the heart of the questions too. A lot of the time the answers don't make sense. Sometimes they even make you question how the people of our country can be so dumb. Yet it's the pursuit of knowledge that drives the show. Much like it does our own humanity. When you cut right down to it, that's what Doctor Who is about, isn't it? And that's what the Feud is about. 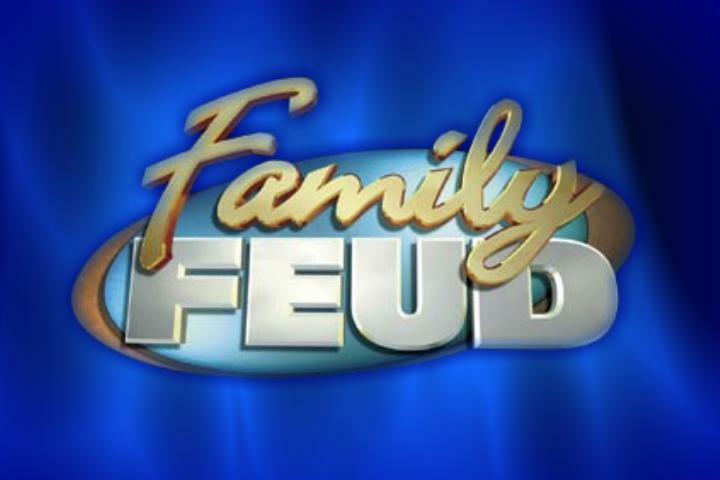 Family Feud, an American Doctor Who? That is sheer genius. Brilliant, man! Thank you sir. Perhaps the greatest enemy of all is the ratings? The Doctor's true weakness. Brilliant indeed! The connections are all there! And another reminder that I need to go ahead and jump into doctor who and give it a whirl. Do you have a particular season/actor you'd recommend starting on? Many would suggest starting with the original doctors back in the 60's -70's, I would however recommend you start with the new series that began in 2005. Start at the beginning of 2005's with Christopher Eccleston. It'll give you enough of an introduction so that you're ready for David Tennant's (my favorite doctor) run. I was about to comment on the 7 word weekend when I saw a red number 1 - this new commenting thing is pretty nice. I dig the notification. Thanks! Eccleston. Now to check netflix.